Photography on the Run: Elevation profile of the 2015 Mt. Disappointment 50K. Generated by SportTracks from my GPS trace of the course using NED 1/3 arc second DEMs. The elevation gain (and loss) is about 6100' or so. Mileages and placemark locations are approximate. 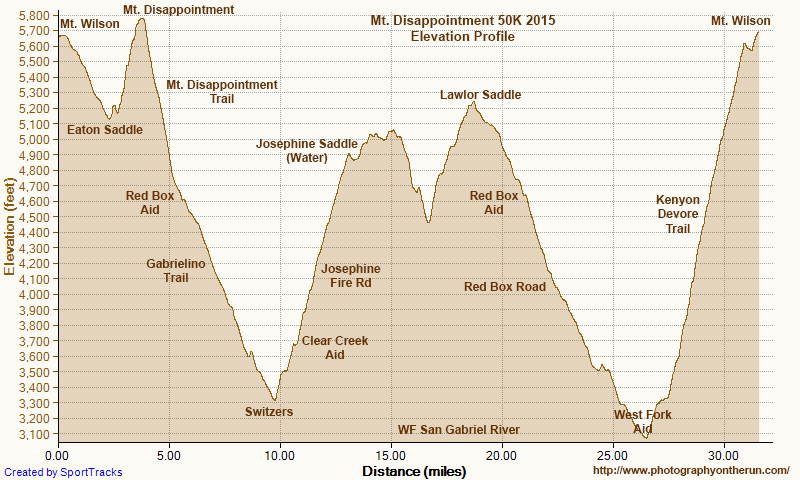 Elevation profile of the 2015 Mt. Disappointment 50K. Generated by SportTracks from my GPS trace of the course using NED 1/3 arc second DEMs. The elevation gain (and loss) is about 6100' or so. Mileages and placemark locations are approximate.